Sophia, a twenty-seven-year-old Bornean orangutan, holds her newborn in her enclosure at Brookfield Zoo October 23, 2008 in Brookfield, Illinois. 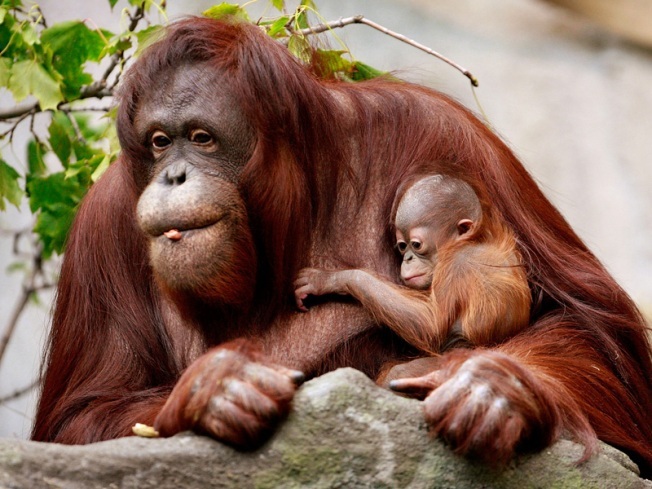 The female infant, which was born October 6, is one of only two orangutan births in North American zoos that year. There are an estimated 61,000 orangutans remaining in the wild, a 50 percent decline since 1990. Brookfield Zoo is to receive $15.6 million in state money to help pay for repairs and updates to its buildings and exhibits. Gov. Pat Quinn on Sunday announced the capital funding, which is part of a state job creation initiative. Brookfield Zoo is owned by the Forest Preserve District of Cook County and is managed by the Chicago Zoological Society. The money will be used to repair the zoo's electrical, sanitary and structural systems, among other efforts, the governor's office said. At a Sunday news conference, Quinn said the funding will "create jobs and help ensure that one of our top tourist attractions keeps people coming to Illinois." The zoo opened in the western Chicago suburb of Brookfield in 1934 and covers more than 200 acres.